Democratic Party 2016 primaries. This table, Democratic Party Table 1, compares the results of candidate Clinton and candidate Sanders applying the standard margin of error calculations. Table show the discrepancies between exit poll results and the unverified computer vote counts. Discrepancies that exceed the margin of error (MOE) of the exit polls are shown in the last column. The MOE applied is the standard formula used when the news media and others report survey results. This MOE only addresses the statistical sampling error associated with the size of the sample. As the size of the sample increases, the margin of error decreases. Presentation of exit poll results are often criticized because the standard MOE formula does not address all the other possible errors common to all surveys. 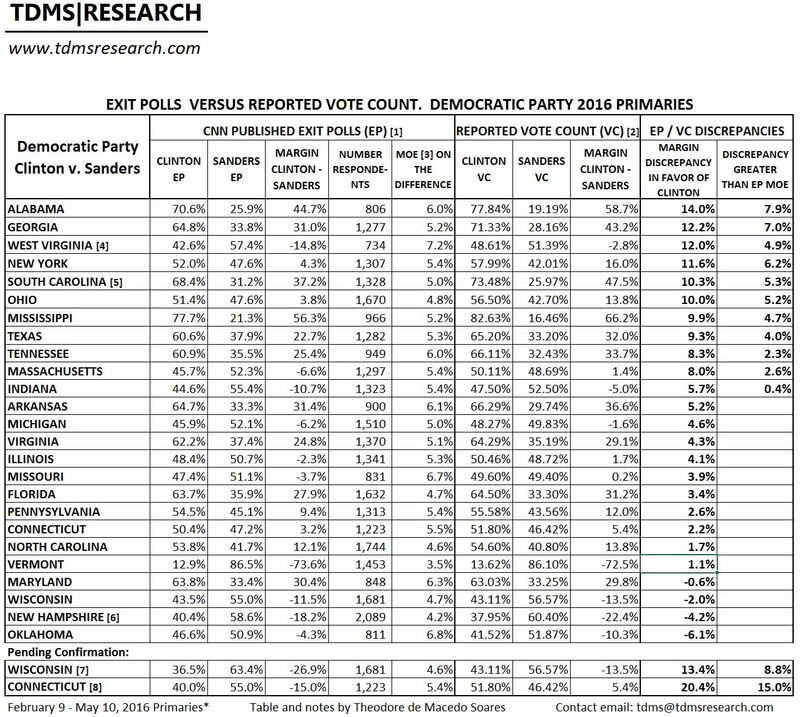 The accompanying table, Democratic Party Table 2, addresses this criticism by taking into account the total survey error (TSE) calculated by comparing 106 exit poll results for the main candidates in the Republican Party primaries with the official vote counts. Some analysts have applied a MOE increased by 30% to exit poll surveys to compensate for their design effect. This increase, ostensibly based on Merkle and Edelman (2000),* is questionable. Merkle and Edelman based their findings on the 1996 Presidential race exit polls that do not necessarily apply to exit polls conducted 17 years later by a different polling firm. Additionally, no details or calculations were published to support their design effect findings. Coincidentally, the total survey error calculated for the 2016 primaries increases the standard MOE by 32% which is very close to the 30% increase in the MOE applied by other analysts. * Merkle, D.M. and M. Edelman. 2000. A review of the 1996 voter news service exit polls from a total survey error perspective. In (P.J. Lavrakas and M. Traugott, eds.) Election polls, the news media, and democracy. Chatham House, New York. 3 Comments on "Democratic Party Table 1. 2016 Primaries"
Then it looks like New York, Massachusetts, and Connecticut may instead have gone to Sanders,. The rest of the results would have stayed where they are. Is that what we are looking at? I’m wondering if there is any other source to corroborate Edison Research data in at least one of these 3 states. Donald Trump Warned Of A ‘Rigged’ Election, Was He Right?